Zig Ziglar Official Memorial video (Version 2 with Lower background music). Some powerful clips of Zig Ziglar Speaking that will inspire you with HOPE and Encourage you to make the rest of your life the best of your life. It will also remind you how special and unique you really are. Share with the world in honor and memory of the Master Motivator & Mentor to Millions... Zig Ziglar. ( Special thank you to Scott Hunt at Pipe Dreams Productions & Chad Smith at The Touch Studios. 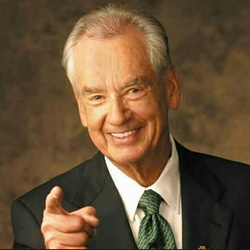 Zig Ziglar passed away last year, but not until he had influenced 250,000,000 people first! Just trust me and watch this video with some of his very best concepts. There's a lot here to think about. It's a three minute classic and part of a much longer presentation but there were two points he made that I loved. First, was about preparing for this presentation. While most of the presentations will be excellent at most conventions, there's always one person who just isn't prepared. It's that one speaker who started to believe his/her own press releases and figured they could just wing it. I'd love to make this part of Zig Ziglar's presentation mandatory to every speaker at any convention. The other point was his comments about stress. It's a part of all our lives and there are very few people who really understand how to deal with it, but I do know what can make the difference for you: You need people in your life who are supportive. You need to keep the negative people out of your life and most important of all, believe in yourself. Surround yourself with people who inspire you and in turn you'll break the hold that stress can have on you. Hang on to every one of those dreams...if you stay focused on your goals, they'll come true when you least expect them. Note: There's a whole series of Zig Ziglar gems on YouTube and they're just a click away. Thanks to a little help from YouTube, I'm in search of Zig Ziglar classics. This one, Attitude Makes All the Difference is a classic. He may have passed away last year, but the ideas he's planted in the world give him absolute immortality!